The technical schema and the impact of the testbed setup at Palghar. Screenshot from a video uploaded by Gram Marg. India has made headlines in recent years as overall Internet use among residents has gone up at an increasing rate. Yet most of these gains are in mobile Internet access and public access points. While people use the Internet on their mobile phones, at cybercafes and public wifi hotspots, less than 2% percent of households have a fixed Internet connection. And even the mobile penetration remains low, at 23% for the whole country. Rural India lacks smartphones and the Internet connections are often patchy and slow, due to a lack of Internet infrastructure. This leaves the vast majority of Indians with limited ways to engage deeply with Internet technology. While accessing information and posting simple files like images online is easy to do from a smartphone, writing code, studying or building a website really requires a fixed connection. The government sees the need for massive investment to roll-out broadband to rural areas in over 600 districts via expensive fibre-optic and other technologies, which can be expensive and time-consuming. But other more efficient solutions are beginning to emerge. One of them is a hardware product that uses television spectrum to provide affordable access to rural communities. The Mumbai-based low-cost prototype recently won the USD $125,000 (Indian Rs 8.2 million) in the Equal Rating Innovation Challenge by Mozilla, the non-profit organisation behind the open-source browser Firefox. 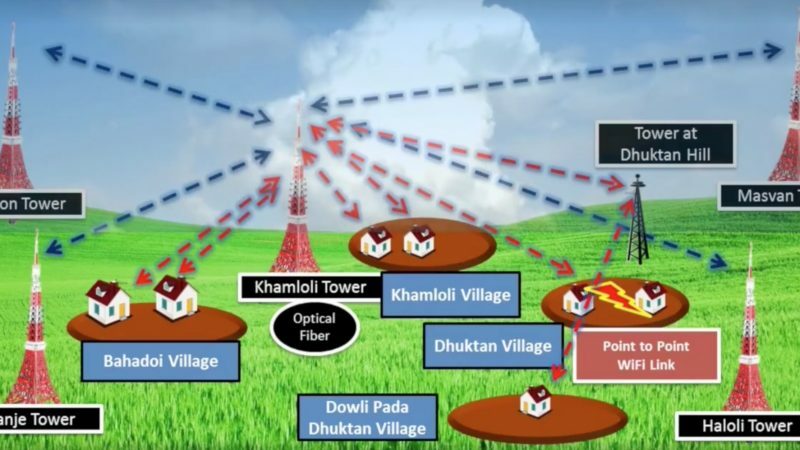 The Gram Marg Solution for Rural Broadband was spearheaded by Professor Abhay Karandikar of Indian Institute of Technology, Bombay (IIT-B) and his team of Masters and PhD students of the institution. Karandikar heads the IIT Bombay Research Park and plays an active role in policy consultation for Internet and broadband in India. The ‘Gram Marg Solution’ could be a deal-breaker in this situation. The benefit of this “Middle and Last-mile” solution is that it is low-cost, consumes relatively small amounts of energy, and can be installed in quickly, using existing TV broadcasting infrastructure to reach distant rural homes. The project aims to bring 640,000 villages in rural India onto the network. It has been rolled out in 25 villages on a pilot basis in the past two years. In telecommunications and the internet industry, the term “last mile” refers to the technology which carries signals from the broad telecommunication backbone along the relatively short distance (aka the “last mile”) to and from its final destination, usually a home or business. The current available last mile solutions to carry internet to rural Indian homes are mainly traditional phone lines and ADSL, coaxial cables and wireless technologies, which mostly use mobile spectrum. Indian mobile service providers are rolling out 4G technologies for faster internet, but they are still costly for the rural population, where smartphone penetration is also low. Gram Marg solves the problem of connecting the unconnected and under-served populations as a “middle mile” and “last mile” solution. It uses the idea of using TV “white space” to enable data to travel between village wifi clusters and a high-speed optical fiber connected distribution base. White space refers to the unused broadcasting frequencies in the wireless spectrum such as television networks. These frequencies are kept empty between channels for reducing interference and buffering purposes. Although mainly used for TV, these are similar to the frequencies used for the 4G technology, and it can be used to deliver widespread broadband internet. The GSM Association, a trade body that represents the interests of mobile operators worldwide, has published a report on potentials of using UHF band White spectrum to carry broadband Internet. 3. Doesn't need line-of-sight connectivity for broadband, which is a major issue (and cost center) especially in hilly areas. I really hope India doesn't have licensing for white space broadband spectrum. The other applications I really liked were the community broadband initiatives, where villages and towns take ownership of their Internet infrastructure. One of the obstacles that this solution may face is the regulatory challenge of making white space spectrum available. Another is that India is phasing out traditional analog TV and switching to digital broadcasting and DTH technologies. This would be a great “Make in India” initiative to boost Digital India across underserved/ unserved rural India. Professor Karandikar says they are working on a sustainable business model that can enable local village entrepreneurs to deploy and manage access networks. It remains to be seen how far the project will go towards lessening India's digital divide, but it has inspired considerable hope among participants and telecommunications experts in the country.